What are Variables in C++? Like human memory , Computer memory has millions of cells where it can store data or information. Now to retreive an information from those cells , each cell should be given one name called as 'variable name'. These variables are mostly useful and can be of different types like integer, float , double , char, strings. What is variable declaration ? Variable declaration means we just create a variable and memory will hold some space for that variable. We did not given any value yet just declared a variable. What is variable definition ? Variable definition means we assigned some value to a variable. 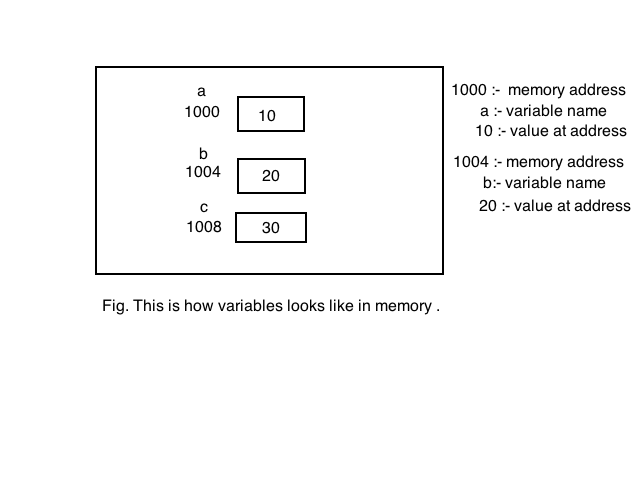 What happens in memory when we declare a variable ? What are local variables ? Local variables persist value only inside a block. If you try to use a local variable outside a block of function or method you will see a compile error. Variable 'a' assigned with value 20 is global variable. That means it is visible in the entire program . Anywhere in any function you can access it. But more closer you are more priority you will get . This is the philosophy of variables :) Inside a main function we assigned a variable 'a' with value 20 thats why it's next print statement printed the value 20.